My friend Ellà is a foodie too, whenever I invite her over, I feel my cooking skills are being tested. I have to admit her food is DELISH! I found out the best way to avoid her comparisons with other recipes was to cook her meals she never had before or at least not common meals, like quails (in Arabic is Ferreh). Position a rack in the lower third of an oven and preheat to 220°C/400°F. Rinse inside and outside of quails, and pat dry with paper towels. Add sumac and salt to the melted butter and use this mixture to brush all 6 birds. Mix sugar and cinnamon and season each of the bird cavities. Fill each of the cavities with one prune, 1 tablespoon of onion, and little of the bunch thyme. Tie the quail’s legs together with kitchen twine, and set aside. In the bottom of a large roasting pan, scatter the vegetables; carrots, celery, the remaining onions and thyme. Arrange the quails on the top of the vegetables. Drizzle with stock and bake for 55 minutes or until quails are cooked through. 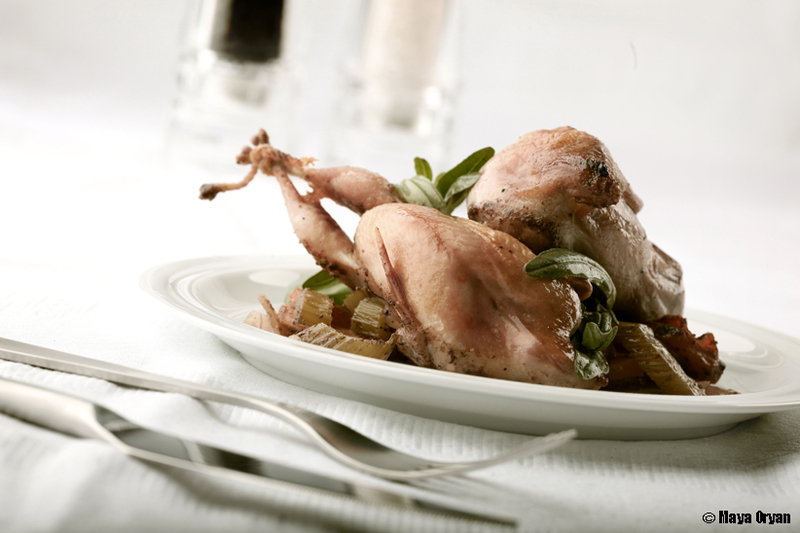 To make the flambé, pour the brandy over the quails and ignite with a match or a lighter. When flame goes out and liquor has burned off, you are ready to serve. It’s great with rice, green salad and pitta bread. This entry was posted in Main Course, Recipes and tagged flambé, Food Stylist, Lebanese food, lebanese food blogger, Lebanese food stylist, Maya Oryan, prunes, quails, Quails flambéed with Prunes and Brandy, Quails With Prunes And Thyme by Maya Oryan. Bookmark the permalink. Very pretty photo! Recipe sounds delish too. Fantastic, Maya. The photo really is very pretty.